5 luxury holiday apartments and 4 cottages on our child-friendly organic farm with stables dating back to 1430. All apartments are fully furnished and feature a new kitchen (with dishwasher, microwave, coffee percolator...). There are a CD player and satellite TV and WiFi as well as separate children bedroom in all apartments. We take care on our younger guests. Only when the kids feel great the parents can enjoy their holiday too. A football pitch and beach volleyball court, play hut, table tennis and table football, Kneipp treatment facilities and adventure playground, lots of children and of course the animals. Cows, calves, cats, rabbits, pygmy goats and hens, horses, ponies and our pygmy pig Gipetto are waiting to be petted. Our horse riding offers! 20 trained horses of all breeds. Qualified lessons in dressage & jumping to level L/L-M. Guided horse riding excursions in the nature park, pony treks for the little ones, lunge rope lessons, moonlight rides, "Reiterstüberl" (riding room), show jumping course, 2 dressage quadrangles, natural obstacle courses, unlimited horse riding options in the nature park. 9 fully-appointed holiday apartments on our child-friendly organic farm with stables, dating back to 1430. We take care on our younger guests. Only when the kids feel great can the parents enjoy their holiday too. A football pitch and beach volleyball court, play hut, table tennis, table football, Kneipp treatment facilities, adventure playground, lots of children and of course the stall with animals are all inviting options. Our minipig Gipetto and various other animals are just waiting to be stroked. 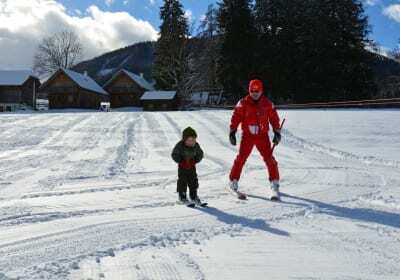 The Grebenzenalm family ski resort is 5 minutes' drive from the farm. 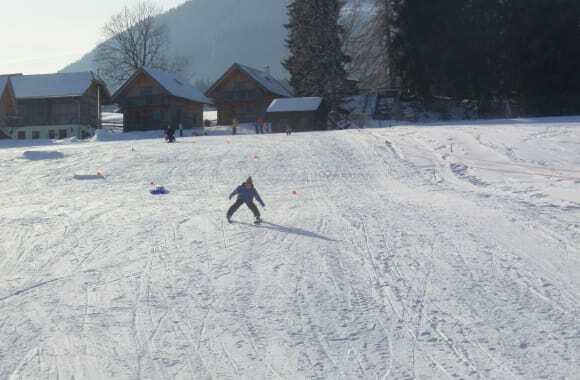 A great ski ski school, cross-country ski runs which pass right by the farm, the sauna area with massage service, free children's lift behind the farmhouse - winter fun is guaranteed. And Schilcherhof guests receive a 10% discount on the lifts in the ski resort. Our horse riding offers! 20 trained horses of various breeds, qualified lessons in dressage & jumping for elementary and elementary/intermediate levels. Guided horse riding excursions in the natural park, pony treks for the little ones, lunge rope lessons, moonlight rides, "Reiterstüberl" (riding room), show jumping course, 2 dressage quadrangles, natural obstacle courses, unlimited horse riding options in the natural park. Want some breakfast? Fresh milk, egg hunt, farmhouse butter on warm farmhouse bread, chives from the garden: salt it - mmm, delicious! We have been organic for many years because we believe in it. Milk from happy cows definitely has the best flavour. 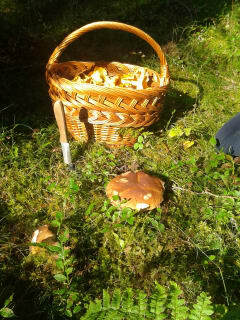 The farm garden is at our guests' disposal, our forests are full of mushrooms (but you do have to find them yourself), go trout fishing for free in our fish pond and computer addicts will become sprites of nature during the barbecue! Jam, ham, farmhouse butter, honey, juices and spices, genuine Styrian pumpkin seed oil, made by us and the farmers from St. Blasen. Real strawberries in the jam and we pick our own melissa for juice - that's the taste of a holiday in Styria! Fresh bread and all sorts of breakfast goodies are supplied to the house daily and of course we also have an organic baker. Where everyone works together and where the cows and hens give their very best. 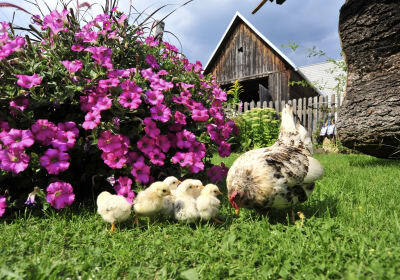 It's quiet up here on the farm - apart from our cockerel Clyde, who calls his hens together for a morning walk. Then our pygmy goats Mäggi and Bäerli start peeking out of their goat house while our pygmy pig Conchita waits for her breakfast. The first flock of children are already on the move in the barn to make new friends and let the sow out. 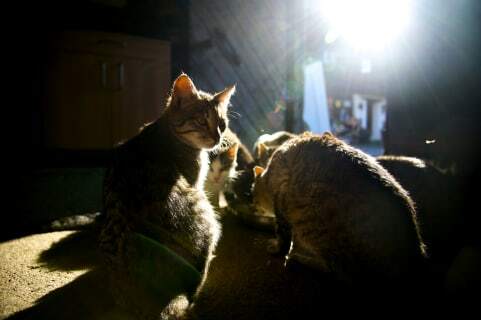 The cats start queuing up over morning coffee, and purr for your affection. All of them want to be stroked... and we've got plenty of them! 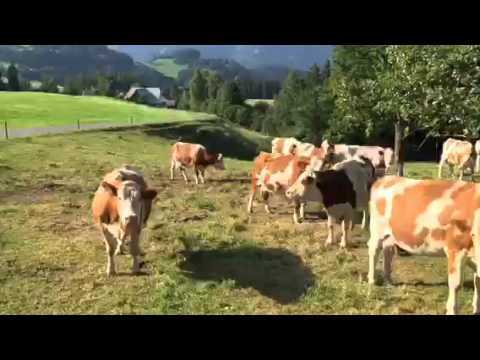 The cows stuff themselves on the green meadow - speaking of cows, their fresh milk has already been collected. The horses are enjoying their morning exercise and galloping across their pastures happily. Manes blowing in the breeze, fiery eyes, strength and elegance - does this make you want to go riding? The Shetland ponies Schneewittchen and Blacky like a quieter life and enjoy their breakfast apples from the children. But the ponies aren't allowed to eat all the apples - the rabbits want some too. The dog is dying to get out and play - holiday stress? No, that's just life on the farm! 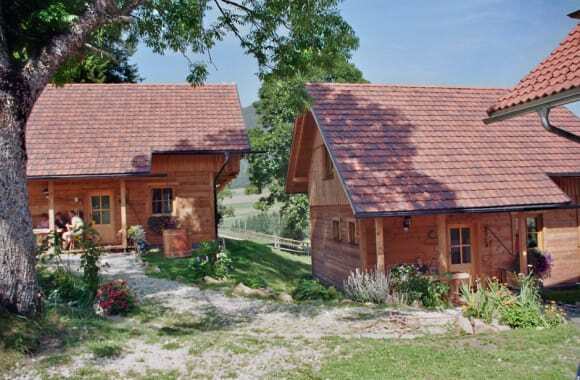 You can live (not just holiday) in our 4 organic holiday homes. Built entirely of natural materials, you can smell what true life tastes like. Wood from our forests, furniture from grandma's time. Here you can feel the past come to life by the crackling fire, whilst still enjoying the present. Only the children running about could disturb your peace. Why not switch off your mobile, too, otherwise everyday life will start getting in touch. Our homely apartments have been stylishly integrated into our historical farmhouse from 1370. 45-60 m², offering a special living atmosphere for the whole family. Feel the past, enjoy the present - our house has some special stories to tell. Old-time furniture, thick stone walls and a crackling fire in the fireplace will help you forget everyday life. Experience a genuine holiday on the farm with genuine people. For practised horse riders and beginners, for trail riders and dressage riders and of course for show jumpers and those who want to be! We offer quality lessons on very well trained sports horses of all breeds. From the elegant crossbred horse to the rural Haflinger to the sport pony, there is sure to be the right horse for everyone. On our Shetland ponies Otto, Schneewittchen and Blacky, parents can do pony treks in the forests with their little co-riders. For experienced riders, we offer guided trail rides through the nature park. On a leisurely horse trek even beginners can explore the beauty of our country. The highlight at the Schilcherhof is, however, our riding lessons. Each lesson becomes a special experience coordinated to horse and rider. Whether lunge lining, on the show jumping course or with beginners' lessons, we always give our very best. Our horses are well trained, looked after excellently and enjoy everything an equine heart could desire on vast pastures. You can sense this contentment when you ride our horses: power, elegance, joie de vivre and health - these are the hallmarks of our animals. Our riders will benefit from this as they feel the horses' joy of movement in riding.